Shown as a 1 min 30 sec documentation excerpt from a live installation performance at Dance Mission. Full piece is 3 channels of video with live performance by Sorvillo and music by Cremaschi. First developed in residence at CounterPULSE in 2005, ‘these are my arms holding you, tearing you apart.’ was conceived and directed as a stage dance piece by paige starling sorvillo and created in collaboration with composers Liz Allbee and George Cremaschi. 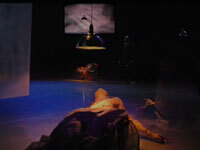 As the piece continued to develop, it became a collaboration with video artist Ian Winters, presented as a 3-channel video installative stage work in the 2007 Women on the Way Festival and as a screen-based work in 2008 with additional soundscape from evelyn ficarra and voice by david wessel. ‘these are’ melds sorvillo’s choreography with text from an undated past to step through the minefield of human intimacy to touch the core of violence. Visually inspired by the medieval tradition of the narrative triptych the screen version explores ideas of disjuncted narrative and encompassing visuals across three simultaneous channels (screens) of video. paige starling sorvillo/ blindsight is an interdisciplinary performance collaborative creating sense-saturated intermedia performance. Devised in and across the languages of immersive and interactive video, contemporary Butoh dance, and experimental music, blindsight brings together extraordinary collaborating artists from multiple disciplines to build fully integrated performance and installation works where each discipline’s voice is heard equally and where new dialects emerge across forms.